Most of their time is spent resting, since their breeding grounds are still a long way off and they need all the rest they can get. But obviously they do a bit of foraging as well, when opportunity arises. This bird is keeping an eye out for flies to eat. The last blog post was about a trip to western Jutland to celebrate spring. One of the aims of that trip was to try and find some cooperative dotterels to work with, but they never materialised. 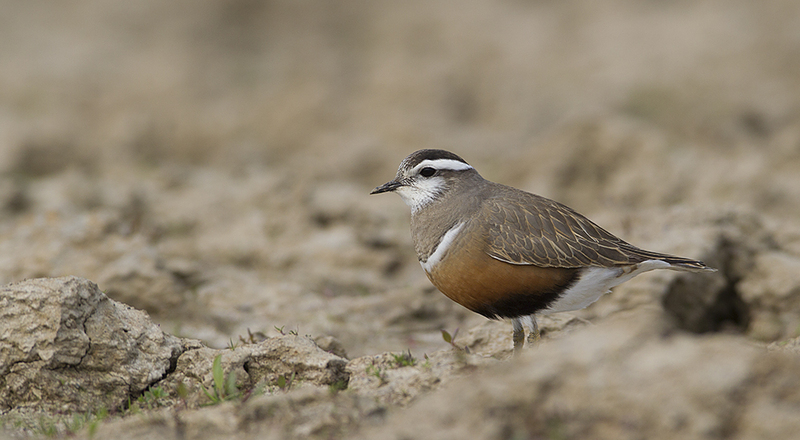 So I had to have another go… This time the dotterels acted their part, and I had a great day in their company. On the 2. day of this little 1½-day trip I found a large flock of maybe 70 individuals hanging out on an as yet un-sowed field – so when I placed myself smack in the middle of the field with my camera on the tripod I wasn’t causing any damage to anyone, least of all the dotterels which quickly accepted my presence. I feel privileged to have spent quality time in the company of such an attractive bunch! As is the case with a few other Arctic waders, the dotterels have reversed the traditional gender roles – the females lay several broods with a number of different males, the males do the incubating and the (limited) chick care. It follows that the females have adopted the males’ strategy for attracting sexual partners; they, and not the males, are the most colourful and vibrant-looking. The difference is clear to see in these shots, since all the birds are in just about full breeding plumage by this time. It was a really windy day in that field, so keeping the camera still and pointed in the right direction was something of a challenge – the lens and camera together are 70cm long. On the other hand, the shots where a lone bird is taking flight were “easy” since it didn’t move around much during that flight – such is the nature of high-wind flying, for paragliders as well as for little birds (if the wind is strong you just sit there, suspended, provided there is any lift). Remember to click on the first shot to open up the gallery! Shooting BIF when sitting flat on my bum with the tripod straddling my legs isn’t easy – but a few shots turned out alright all the same. This one and the next four are from a lucky burst – the EOS 1D mkIV is a fine piece of equipment! The bird isn’t actually going anywhere, just spreading its wings and exercising a bit. Motion just about frozen, only because the wings are at the apex of their beat here. …and just about at the opposite end of the spectre, 1/10th of a second later. In the middle of the movement the speed of the wingtips is so high that they become blurred, even at this relatively high shutter speed.